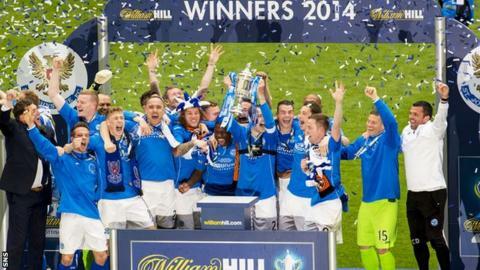 Steven Anderson and Steven MacLean grabbed the goals as St Johnstone beat Dundee United 2-0 in the Scottish Cup final. It was the first time the Perth men had reached the Scottish game's showpiece in their 130-year history, and they took home their first major trophy. He was showing nerves early in the match but settled down and produced a solid performance, including a few fine second-half saves. Also got lucky when Nadir Ciftci's free-kick hit the bar then hit him. The skipper was excellent from the first whistle, he led by example and was a big reason why St Johnstone won the Cup. He went toe-to-toe with Nadir Ciftci and came out the winner after an incredible performance. As with the rest of the back four, Anderson was at the top of his game. He put in tackle after tackle and also scored the all-important opening goal. Did the basics very well, made his tackles, and got forward whenever he could. An unsung hero of the Saints side but so important. He broke things up and used the ball well when he won it. The midfielder kept the ball well and showed great work-rate and commitment. A very effective display as he got up and down the pitch so often. Worked hard for the team and was unlucky not to score after an excellent break up the park. The big player for Saints in the first half, he looked a threat going forward but also did his shift in defence when called on. His game awareness and link-up play was outstanding. He showed real bravery in the challenge with Radoslaw Cierzniak and was rewarded with a goal. Linked very well with MacLean and although he did not get a goal, he did a real shift for the team. Made a real impact on the game, working hard up and down the pitch and also putting in some great tackles at the back. He was only on for a short spell but did his shift and helped see out the game. One of those days for the goalkeeper. He cost United the first goal when he flapped at a cross and never recovered. Also lost out in the tackle with MacLean at the second goal. Never really got to grips with the game and was unable to stop the St Johnstone strikers. He tried to get forward when he could and produced a couple of good runs. Did no do the basics properly and at times his distribution was very poor. Tried a flick in the second-half that summed up his day. The left back was a willing runner and he put in a great cross for Ryan Dow, who hit the post, but faded out of the game later on. He has been excellent this season but this was a below-par display. He sat too deep and seemed miles off the pace. Bags of effort from the midfielder and he made some decent passes but not effective enough. Came up against a Dave Mackay at the top of his game and never really got a look in. Hardly had a run at the defence and was very quiet. The game just passed him by. He's a very big player for United but was ineffective when his side needed a big performance. Hit the post in the first half and was unlucky with the effort. He tried to get forward but has to be stronger at times. Looked good with a couple of touches and hit the bar with a free-kick, but he has to do more. He was well marshalled by the St Johnstone back line. Made no impact when he came on, hardly touched the ball, although that is maybe down to how well St Johnstone were playing in defence. Had a couple of efforts and really should have scored with a late header.